Personalised soft pet bed embroidered with a name or text of your choice. Personalised soft pet bed embroidered with a name or text of your choice. 74x50cm navy fabric cushion bedding in a convenient size for cats or dogs. Personalised your pets living space with their name embroidered in your choice of text thread colour and little paw print motifs. Personalised soft pet bed embroidered with a name or text of your choice. 74x50cm navy fabric cushion bedding in a convenient size for cats or dogs. Personalised your pets living space with their name embroidered in your choice of text thread colour and little paw print motifs. 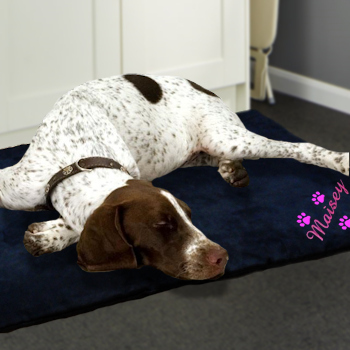 Soft and durable padded mat with removable fabric cover and washable inner pad that will either make a great base for a bedding box or use alone, easy care machine washable and tumble dry low or air dry. A useful gift for your pampered pet.